Hold on to your hats, magpies: Queen Maxima brought some major sparkle with her to Wellington for tonight's state dinner! 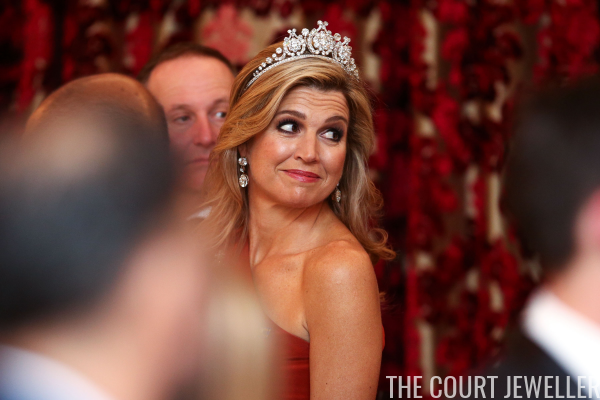 Although the dinner was black tie, Maxima popped on a tiara anyway. (Love her for that!) 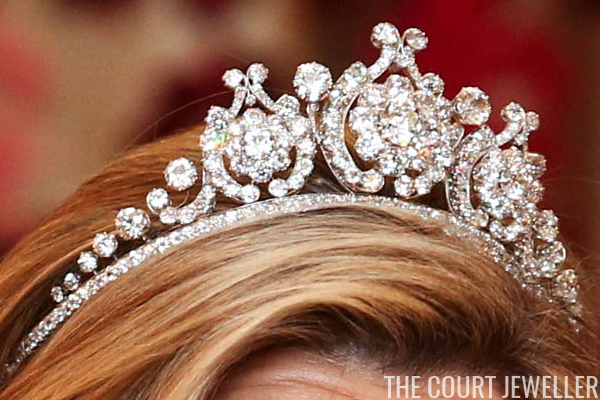 This is the all-diamond version of Queen Emma's Diamond Tiara, ordered by King Willem III for his wife (that'd be Queen Emma) in 1890. He died just before the tiara was delivered to Emma at the palace. And here's a look at Maxima's entire ensemble. The diamond scroll/floral brooch is also from Queen Wilhelmina's collection, and Maxima is wearing her diamond wedding and family initial bracelets. She's also wearing the miniature ribbon and badge of the Order of the Netherlands Lion.